Your source for ideas and best practices in Human Resources (HR), assessments and survey solutions. Running an Employee engagement survey is vital for companies today. These surveys measure the extent to which employees feel committed to their jobs and are willing to go an extra mile for their organisation. Employee engagement is critical in driving a company's success. 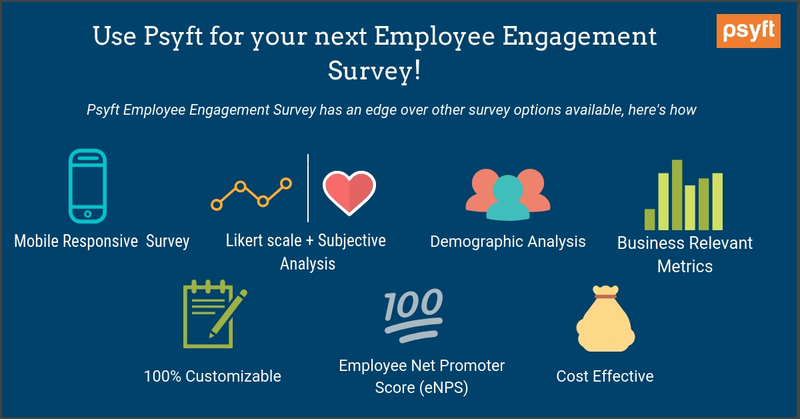 Such surveys, when done right, are very beneficial in gathering the right insights on engagement levels of employees & identifying the pain areas ought to be addressed. Provide honest picture on employees’ experience at work. Give employees an opportunity voice concerns. Make employees feel valued at work. Act as a catalyst for improving employee experience. Help initiate a culture of transparent & open communication. Employee feedback can have serious impact on an organisation's bottom line and thus, running employee engagement surveys with proper methodology is vital. Wrongly administered surveys can have a huge negative impact on the engagement levels in organizations. Therefore, it is important for companies to be aware of what employee engagement aspects to be addressed, how to run such surveys, what platform to implement, etc. Psyft EES is a mobile friendly survey, i.e the survey can be completed on smart phones as well. This makes it even easier for participants to stay connected and participate in the survey. Very often employees use their smart phones to complete the survey while travelling etc. This also helps in getting maximum participation while ensuring timely completion of the exercise. Unlike many regular employee engagement surveys, which use only the likert scale for capturing responses; Psyft EES also covers partially open ended, fully open-ended questions where employees can express their views clearly. Psyft Employee Engagement Survey also calculates the eNPS. eNPS measures the likelihood of an employee to be willing to recommend an organization as a place to work. eNPS benchmarking allows companies to know where they stand in comparison to their competitors. Using Enps benchmarks properly allows organisations to plan their game better. Benchmarking could be within a specific industry, and against both direct and indirect competitors. Companies with scores higher than their competitive set grow faster and are more successful. Psyft Employee Engagement scores are analysed across various demographic groups – i.e. Gender, Department, Age, Tenure, Seniority, etc. Thus, enabling companies to identify the right target areas and address these in the most effective manner. In an effort to encourage an inclusive survey, engaging employees across the world, Psyft supports Employee Engagement Surveys in multiple languages. Psyft EES is the perfect survey solution for global companies working on an international level. The survey questions, are available in multiple languages to capture maximum cultural diversity and usability. Psyft EES covers a wide range of business relevant performance metrics to measure employee engagement. These dimensions include everything required for employees to remain committed & engaged at work. Many companies often have their own set to competencies to be mapped. Psyft EES offers companies an option of customizing surveys based on a company's business objective and requirement. Psyft is known to offer the best employee engagement survey experience at the most cost-effective budget. We design & implement high quality surveys for companies in the most effective manner at the most reasonable prices. Why Run a 360 Degree Appraisal? Even our Prime Minister uses 360 degree feedback appraisal for his officers! 6 ways GST may impact salaries - Work cut out for HR Professionals!